Architect: Chicago architect and restaurant designer Mark Knauer in partnership with Birmingham architect Christopher Longe. 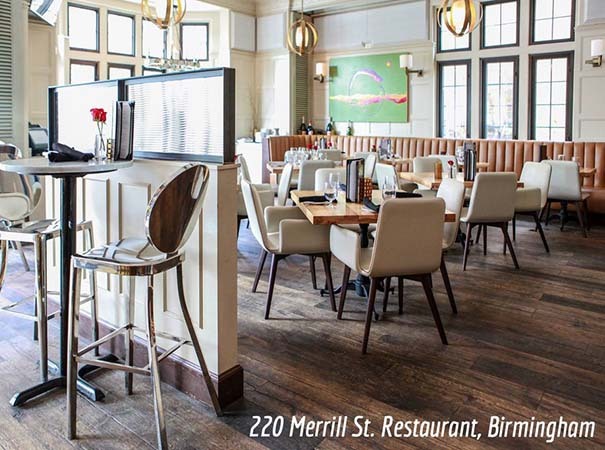 The Birmingham upscale attraction 220 is a landmark in history. In 1932 the building was originally constructed by The Detroit Edison Company and served as the offices for the Northern suburbs. In August 1979 the Detroit Edison Company sold the property to a small group of developers and one of the first full-service restaurants in the city was born. 220 Merrill Street Restaurant operated as a local gathering place over 15 years. Whether you were a regular, a local or just stopping in town, everyone was welcomed. The menu at 220 is comprised of mainly contemporary American cuisine. The popularity of the restaurant over the years caused it to be nicknamed and was official shortened to be known as simply, 220. In 2014 Denise Ilitch and her business partner Zaid Elia, owner of the Elia Group, purchased the Old Detroit Edison building. Once Ilitch and Elia began to work on renovations they wanted to be sure to keep the spirit of the old restaurant alive. The design and renovations were done by Chicago architect and restaurant designer Mark Knauer in partnership with Birmingham architect Christopher Longe and furniture for the restaurant was provided by Italmoda in Royal Oak, Michigan. The renovated restaurant launched on July 30, 2014 with an all white attire grand opening.